Hitt Law Firm is built upon attorney Curtis Hitt's years in the trenches of Arkansas courtrooms, first as a prosecutor, then in private practice, through thousands of cases. Not every case should go to court, but every case should be prepared as if it will. Only then can a client expect to achieve the best possible result. 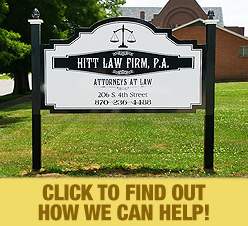 At Hitt Law Firm our settled focus is on representing the injured and the accused. We recognize that whatever leads you to our door may be the most pressing concern in your life. With integrity and experience, we are prepared to see you through it and ensure the best possible outcome. Welcome to our website. Please peruse the pages featured here, and feel welcome to contact us by phone at (870) 236-HITT (4488) for a personal, no-obligation telephone discussion of your issue so that we can determine if our law firm is right for you. © Copyright 2019 by Hitt Law Firm. All Rights Reserved.